WHY BUILD WITH PM CYCLES? WHY MAKE PMC YOUR BIKE SHOP? For one we have been here 30 years now!! MANY CUSTOMER'S OFTEN ASK THEMSELVES "WHAT CAN A CUSTOM SHOP REALLY DO FOR ME? 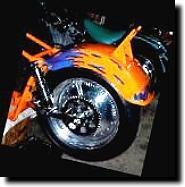 WELL FOR THOSE OF YOU WHO HAVE EVER TRIED TO BUILD A BIKE YOU KNOW WHAT IS INVOLVED AND OFTEN A LOT OF TRIAL AND ERROR. THIS TRIAL AND ERROR CAN RUN YOU INTO A LOT OF MONEY BEFORE YOU KNOW IT. 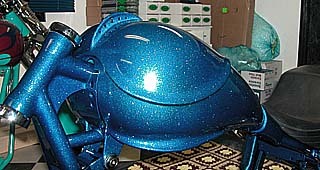 AT PMC WE ALWAYS TRY TO BUILD DIFFERENT PARTS OF ANY PROJECT TO BE UNIQUE TO THAT BIKE. 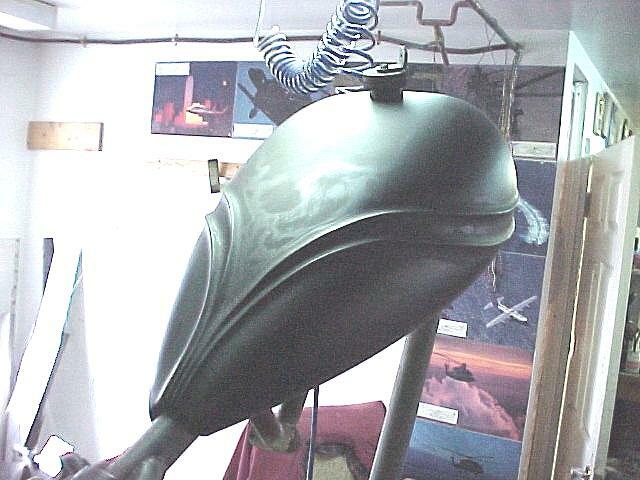 HAND STRETCHING GAS TANKS IS ONE OF OUR SPECIALITIES. WE FEEL THAT THE TANK IS OBVIOUSLY ONE OF THE IMPORTANT VISUAL FEATURES OF ANY BIKE. TO HAVE THE TANK CUSTOM FIT THE BIKE LIKE A GLOVE IS EASILY VISUALLY APPARENT WHEN COMPARED TO THE VERY ROUGH FITTING BOLT-ON TANKS. AS WITH ANY CUSTOM YOU HAVE EVER SEEN THE BEAUTIFUL ONES BLEND TOGETHER SMOOTHLY AND SEAMLESSLY. THIS IS THE RESULT OF MANY HOURS OF CUSTOM CARE. 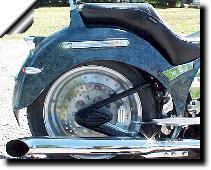 TANKS AND FENDERS ARE WHAT CHANGES THE SHAPE OF ANY BIKE. CUSTOM MEANS JUST THAT. "CUSTOM!!" A LOT OF WHAT GETS DONE DEPENDS ON THE PLAN BEFORE THE BUILDING STARTS. EACH AND EVERY ONE HAS DIFFERENT TASTES AND THAT IS WHY THE HARLEY DAVIDSON LENDS ITSELF TO BE THE TRUELY UNIQUE "PERSONAL MACHINE". WE, AS CUSTOM BUILDERS WANT TO HELP YOU GET WHAT YOU WANT THE FIRST TIME. IT IS OUR EXPERIENCE AND EXPERTISE THAT WILL MAKE YOUR DREAM COME TRUE. GET YOUR PARTS AND YOUR PRIDE AND JOY SERVICED AT A "PROFESSIONAL WELL ESTABLISHED" BIKE SHOP. ESTABLISHED SHOPS CAN HELP YOU OUT WITH INFORMATION ABOUT WHAT IS GOOD OR RIGHT FOR YOUR BIKE AND WHAT MAY BE CHEAPER SECOND GRADE PARTSAS THEY HAVE BEEN INVOVED WITH BIKES EVERY DAY AND HAVE EXPERIENCE AND HAVE TRIED MANY PARTS IN THEIR PAST. IF YOU TAKE YOUR BIKE TO BE SERVICED AND GET YOUR QUESTIONS ANSWERED BY A SHOP YOU TRUST, THEN SUPPORT THEM BY BUYING YOUR PARTS FROM THEM ALSO. THEY HAVE WORKED HARD TO KEEP THEIR BUSINESS ALIVE AND INCURE ALL THE COSTS OF BEING A LEGITIMATE BUSINESS. A HARLEY DAVIDSON IS A BIG INVESTMENT AND LASTS FOREVER. IF YOU ARE REGULAR CUSTOMER, AT MOST SHOPS, YOU WILL BE TREATED AS SUCH. YOU WILL RECIEVE THE SAVINGS, SERVICE AND ADVICE BY SUPPORT YOUR LOCAL ESTABLISHED LEGITIMATE BIKE SHOP. SUPPORT A DEALER WHO HAS A HISTORY, WHO IS CONCERNED ABOUT YOUR NEEDS, AND WILL HELP YOU GET THE RIGHT PART THE FIRST TIME AND WHO WILL BE THERE FOR YOU TO HELP AND ANSWER YOUR QUESTIONS NOT ONLY "NOW" BUT ALSO IN THE FUTURE. THEY WILL APPRECIATE YOUR LOYALTY. WE ARE OPEN ALL YEAR LONG, WINTER AND SUMMER.